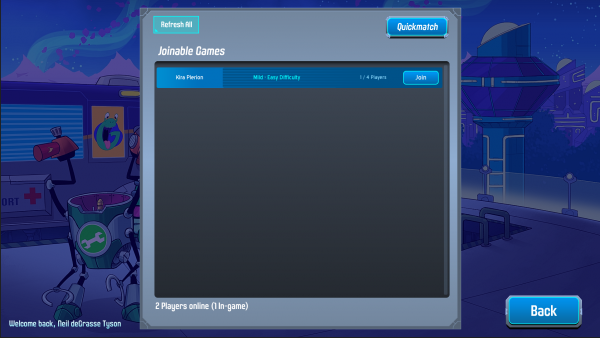 After adding a few different difficulties to Space Food Truck, our simple “quickmatch” solution for online games felt like it needed a little attention. This weekend we’re testing a new solution in our “thar_be_dragons” beta branch: a lobby screen that lets you browse every available game. It’s pretty simple at the moment, you can quickmatch like old times or be picky, but it lays the groundwork for our next big addition: asynchronous play. We’ll also be adding some better “rejoin” functionality soon for players who get lost in space. Also new this build: 12 new crisis scenarios (3 for each room). If you want to help us troubleshoot the new lobby this weekend, right-click Space Food Truck in your Steam games library, click Properties, go to the betas tab and switch to “thar_be_dragons” in the dropdown. As always, let us know what you think either by posting in our Steam discussion group or emailing us directly with any issues you run into at bugs@spacefoodtruck.com. Fixed an audio SFX volume adjustment bug after leaving a game.